With a complete line of products designed to let you explore and reveal your own personal perspectives, Lensbaby lets you reframe possibilities and confound expectations. So just what kind of creative freedom can Lenbaby give you? And what makes it so special? Join us at our Lensbaby workshop and understand more about this superbly unique lens for DSLR cameras, with the opportunity to try* them out for yourself! Tech Reviewer and Commercial Photographer Allan Lee, who had reviewed the new Lensbaby Spark when it was launched, will have all your questions answered. 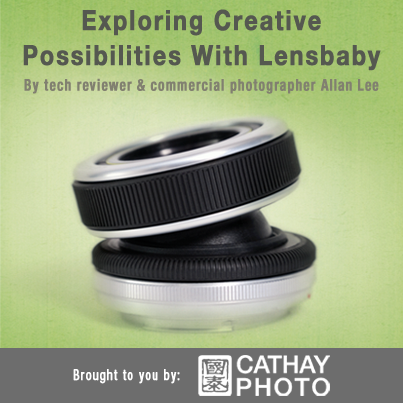 Get ready to experience a whole new level of creative freedom with Lensbaby! Limited to a maximum of 15 participants only. Registration is FREE. *Participants are encouraged to bring along their own cameras, but please note that Lensbaby demo units are only available in Canon & Nikon mounts during the workshop. This entry was posted in Brand: Others (Cosina, Carl Zeiss, Leica, Mamiya, Samyang, Vivitar, Zenitar,etc), Photography Courses & Events, Uncategorized and tagged Cathay Photo, Lensbaby, SJS Photography Events. Bookmark the permalink.